Do you work with wood? 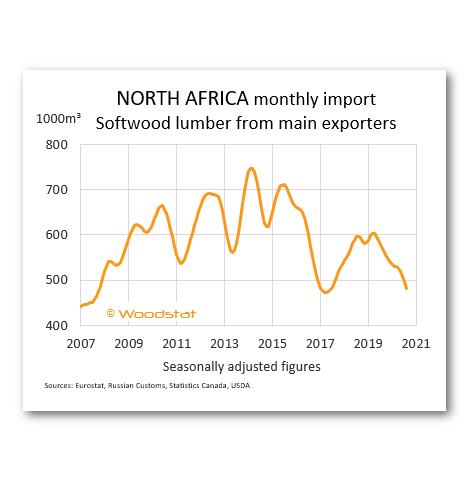 We help you stay up to date with what happens on the softwood lumber market, so you can make more informed decisions, keep an eye on the market - and your competitors. We help you keep an eye on the market. Knowledge is the foundation to all good decisions. We give you better insights with the latest statistics from around the world. We publish a newsletter approximately 400 times every year containing the latest statistics and analysis for the lumber industry. Our newsletters give an overview of the latest news on the market around the world. Browse our charts database and keep up to date with the wood market. The charts are sorted per continent, country and type. Keep up to date! Let us help you. Knowledge about of what is happening in the world enables you to better plan, act and assess the market. We collect data from all over the world so that you easily can find what is most important for you. Since you need to make decisions based on the latest information, we send it to you without any unnecessary delay, often the same day as the data is published by the source. We have customers worldwide. Where are you? We have customers in Sweden, Finland, Canada, Russia, Germany, Japan and more. Common customers include: sawmills, forest owners, banks, flooring manufacturers, woodworking factories.